Shimmer Silver Surfer T-Shirt - This is an officially licensed superhero tee shirt from comic book giant, Marvel. 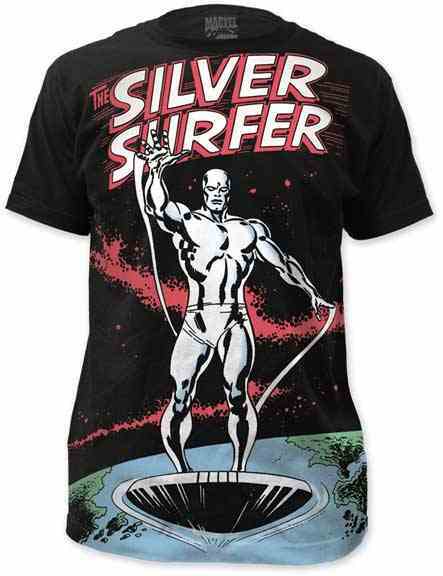 This Silver Surfer t-shirt makes a great gift for any long time fan of this cool comic book character. Our Silver Surfer tees are extremely comfortable and made to last. The print of the Silver Surfer character is a silver metallic ink and definetly stands out in the crowd. Silver Surfer t-shirts is made of 100% preshrunk cotton and has the Marvel logo on the inside label. If you have questions regarding our Silver Surfer t-shirt or any of our other officially licensed merchandise by Marvel, please email us and include the product name and number.